Exercise shouldn't feel like a chore or something that has to be checked off your to do list. It should be a priority and an activity that fits into your daily routine, just like brushing your teeth or taking out the trash. 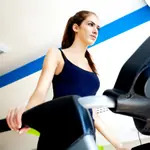 However, kick-starting your workout regimen can be a challenge because there will always be some excuse or activity that gets in the way of taking care of yourself. Whether you're busy with carpool or working a 10-hour day, making exercise a priority is something that's beneficial to you and your own body. There are countless times when we say we're going to take up the latest bootcamp class or head out for a 3-mile run around the neighborhood. However most people don't actually do it. It's easy to get distracted and even easier to give up if we're not seeing results as fast as we would like. The thrill of starting something new and challenging can dissipate over time if you don't stick with your plan. If your mind is strong, then your body will follow. Don't let excuses and the afternoon munchies stand in your way of that body you've always dreamed of. Here are six ways to make exercise a priority. We're all guilty of throwing ourselves into some new fad workout; but then finding ourselves bored and itching for something new, again and again. It's important to start slow with something that you know you like to do, such as running or even walking. If you have free time in the afternoon, head out for a nice jog or a brisk walk with a friend. Make your physical activity a time to have good conversation. This can help entice you to continue with your routine because you won't view it as something you have to do, but rather something you want to do. Working out with a friend will be something that you look forward to and who knows, maybe you'll push each other to train for a local 10K or even a half-marathon. Going from zero to 60 is never a solid way to start a new routine, mainly because you'll burn yourself out quite fast. It's important to set realistic and reasonable goals that you know you can accomplish. For example, "I will wake up every morning at 5 a.m. and run 2-miles" is most likely not a practical task for anyone; and you don't want to feel guilty for not meeting your goal. A reasonable goal in sight is the way to go and you're sure to not be disappointed. Plan to exercise at a certain time each day so it becomes a part of your schedule. If you know at two pm you have your favorite Pilates class, or made plans to meet a friend for an afternoon jog, stick with it. Planning your workouts ahead of time allows you to have something to look forward to and, like stated above; having a reasonable goal is essential in accomplishing them. If you don't set up some sort of plan, it's easy to back down and procrastinate. But who wants to back down on their health? Schedule your activity by putting it in your phone, writing it on your fridge or even having a friend bombard you with annoying text messages until you get yourself going. You'll feel refreshed, invigorated and happy that you chose to dedicate an hour to yourself and health. Alana Michelle Brager is fitness and health freelance writer, who shares her health tips and recipes on her blog, Edible Health and motivational fitness pictures on A Fashionably Fit Lifestyle. Alana is becoming a Certified Fitness Nutritionist through the International Sports Sciences Association, while also writing for the websites Life2PointOh.com and MyDailyFind.com.